Dr. Zhong Su, received his doctoral training in immunology at The University of Queensland, Australia. He then moved to Canada and took postdoctoral training in parasite immunology at the McGill University. 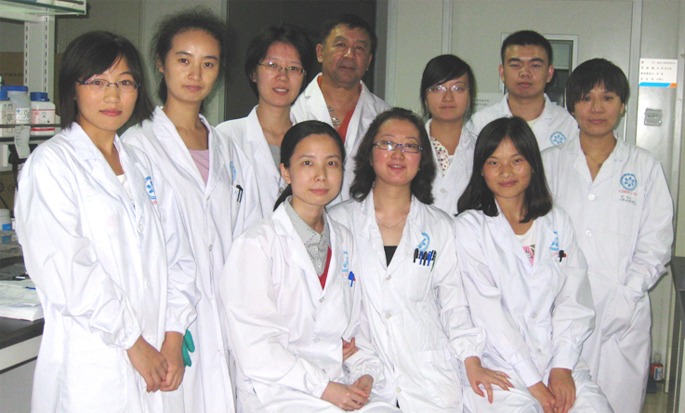 Before joining the Guangzhou Institutes of Biomedicine and Health in 2007, Dr. Su worked as a Research Associate at the McGill University Health Center in the research area of malaria immunology. He is an author of 20 peer-reviewed journal articles of parasite immunology. Since he joined GIBH, he established an immunobiology laboratory and continued a number of research projects of malaria and helminth immunology. One of major research projects in our laboratory is to develop a transgenic whole-pathogen malaria vaccine. We are using a novel strategy to genetically modify the malaria parasite which is expected to be a safe and protective vaccine for control of malaria, a devastating infectious disease of humans. A number of projects are also undertaken to investigate the cellular and molecular mechanisms involved in regulation of immune protection against malaria and maintenance of immunohomeostasis during malaria infection. Immunology of helminth parasites (or worms) reveals many interesting and important features of host-pathogen interactions including immunosuppression. In our laboratory, we have been studying the cellular and molecular pathways that mediate the immunosuppression induced in the host by nematode parasites. We are also making efforts to identify the factors produced by nematode parasites that are responsible for induction of immunosuppression, and the structure-function relationship of the parasite-derived immunomodulatory molecules. 1. Zhaotao Li, Guiyun Liu, Yue Chen, Yunfeng Liu, Boyu Liu and Z. Su. 2011. The phenotype and function of naturally existing regulatory dendrtic cells in nematode infected mice. Intl. J. Parasitol. Accepted. 2. Liu, S., J. Dong, G. Mei, G. Liu, W. Xu, Z. Su, and J. Liu. 2011. Crystallization and preliminary crystallographic studies of a cysteine protease inhibitor from the human nematode parasite Ascaris lumbricoides. Acta Crystallographica Section F: Structural Biology and Crystallization Communications. F67, 228–230. 3. Segura, M., C. Matte, N. Thawani, Z. Su, and M.M. Stevenson. 2009. Modulation of malaria- induced immunopathology by concurrent gastrointestinal nematode infection in mice. International Journal for Parasitology. 39:1525–1532. 4. Segura, M., Z. Su, and Stevenson M.M 2007. Impairment of dendritic cell function by excretory-secretory products: A potential mechanism for nematode-induced immunosuppression. Eur J Immunol,37:1887-1904. 5. Su, Z., Segura, M., and Stevenson M. M. 2006. Reduced protective efficacy of a blood-stage malaria vaccine by concurrent nematode infection. Infect. Immun. 74:2138-2144. 6. Su, Z., Segura, M.A. Loredo-Osti, C., Morgan, K. and Stevenson, M.M. 2005. Impairment of protective immune response to blood-stage malaria by concurrent nematode infection in mice. Infect. Immun. 73:3531-3539. 7. Su, Z., Tam, M.-F., Jankovic, D, and Stevenson, M.M. 2003. Vaccination against blood-stage malaria in mice using novel immunostimulatory adjuvants. Infect. Immun. 71: 5178-5187. 8. Su, Z., Fortin, A., Gros, P. and Stevenson, M.M. 2002. Opsonin-independent phagocytosis: An effector mechanism against acute blood-stage Plasmodium chabaudi AS infection. J. Infect. Dis. 186: 1321-1329. 9. Su, Z., and M. M. Stevenson. 2002. IL-12 is required for antibody-mediated protective immunity against blood-stage Plasmodium chabaudi AS malaria infection in mice. J. Immunol. 168:1348-1355. 10. Stevenson, M. M., Z. Su, H. Sam, and K. Mohan. 2001. Modulation of host responses to blood-stage malaria by interleukin-12: from therapy to adjuvant activity. Microb. Infect. 3:49-59. 11. Su, Z., and M. M. Stevenson. 2000. Central role of endogenous gamma interferon in protective immunity against blood-stage Plasmodium chabaudi AS infection. Infect. Immun. 68 (8): 4399-4406. 12. Ing, R., Z. Su, M. E. Scott, and K. G. Koski. 2000. Suppressed T helper 2 immunity and prolonged survival of a nematode parasite in protein-malnourished mice. Proc. Natl. Acad. Sci. USA, 97 (13): 7078-7083. 13. Koski, K.G., Z. Su, and M. E. Scott. 1999. Energy deficits suppress both systemic and gut immunity during infection. Biochem. Biophys. Res. Comm. 264: 796-801. 14. Sam, H., Z. Su, and M. M. Stevenson. 1999. Deficiency in tumor necrosis factor alpha activity does not impair early protective Th1 responses against blood-stage malaria. Infect. Immun. 67:2660-2664.